If you look at EFSA pending health claims, curcumin is thought to alleviate more than 10 health conditions, Manfre says. Although curcumin has been linked to joint health, it is also known for its anti-inflammatory properties, and is efficient as a digestive solution, as well as a solution for immunity and anti-aging. “Another aspect that is very interesting for consumers is the fact that curcumin is a classical antioxidant, which means its main mode of action is via free-radical scavenging. Some studies even imply that curcumin not only neutralizes free radicals, but also boosts the activity of the body’s own antioxidant enzymes, and thus helps to protects our cells from oxidative stress and damage,” says Rachela Mohr, Business Development Nutrition, Wacker Biosolutions. Responding to market demands, Naturex introduced Turmipure, an organic turmeric extract for joint health. The most common application will be caps or tablets for the supplement industry and products containing Turmipure are expected to be launched in the next few months, according to Manfre. Doctor’s Formulas launched Curcumin 200mg Liposomal Formula, a dietary supplement containing Turmeric root extract (Curcuma longa) with a 95% content in Curcumin elements. The liposomal formulation allows for the higher absorption of the active substances, according to the company. Theravalues introduced Theracurmin Super, a bioavailable form of curcumin developed by Theravalues Corporation based in Japan. According to the company, 40 clinical studies and pre-clinical studies on the product prove its potential benefits for the prevention and treatment of “Chronic Inflammation” based diseases. Theracurmin Super with enhanced bioavailability has been launched in Europe. PLT Health Solutions launched Slimvance Core Slimming Complex, a patented, synergistic formulation of three spices: Curcuma longa, Moringa oleifera and Murray koenigii. The combination resulted from screening hundreds of different botanicals to develop synergistic performance supporting weight loss. The ingredient is supplied as a free-flowing powder that can be delivered in supplements, foods and beverages. Akay USA LLC introduced CurQfen, which it claims is a "new generation" bioavailable curcumin with enhanced "free" curcuminoids absorption (45.5-fold), tissue distribution, blood-brain-barrier permeability and enhanced efficacy supported by peer-reviewed publications and clinical trials on heart, liver and brain health. CurQfen is a natural, non-GMO, allergen-free product, the company reports. Wacker has launched Cavacurmin, a highly bioavailable curcumin formulation, which is suitable for dry or powdered food supplements, such as tablets, capsules and energy bars, as well as for functional beverages. The company has also highlighted recent studies on the product which underline its bioavailability. 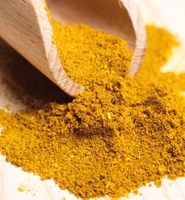 With turmeric’s rising popularity have come concerns regarding its sourcing and traceability aspects. Companies are responding to these challenges with initiatives such as Naturex’s Pathfinder program, an approach aimed at guaranteeing traceability, transparency and trust. “We have developed a sustainable and traceable supply chain that is unique to us, in which concerns about quality and the risk of adulteration have been eliminated. Through the Pathfinder program, Naturex is encouraging the market as a whole to raise its standards to those equivalent to certified organic,” Manfre says. Despite any issues concerning the supply chain, growing consumer interest and the many studies into the health aspects associated with curcumin and turmeric are strong indicators that these will remain key ingredients to watch out for.